We all would love to reinvent our bathroom with different and colorful tiles. You must look upon different tips and ideas before deciding which one is your choice. 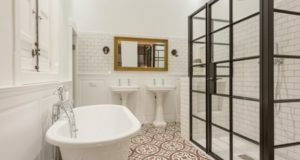 Moreover, it’s very hard to select one bathroom tile out of many choices available to you in the market or online portals. Here are some of the ideas and tips which will help you out in selecting the best one for you. When we start with a bathroom renovation we might have one or two style of tiles in our dream. Pick the tiles of your dream in approximately the similar way they are designed. Sometimes, it is very unique and works according to your bathroom but sometimes they are very simple too in the way they appear to us. 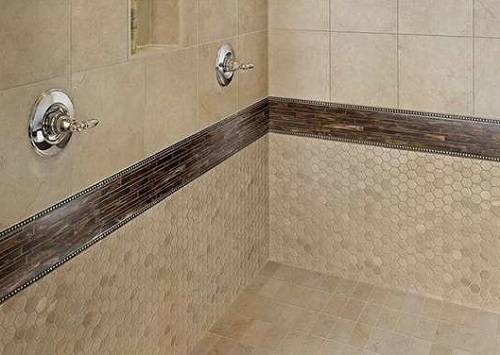 So, pick that dream tile then accordingly choose the corresponding tiles that you want to look have in your bathroom. Your first selected tile that is, your dream tile will be your starting point in choosing the next tile. Thus it will help you to choose another two or three different tiles that you want and move ahead while re-designing your bathroom. Also, if you want to select your first tile to be very lively and colourful then there is no harm to have the corresponding tiles also in different colours, style and pattern. However, if your first choice is really plain and you want to go for a different tile or pattern then select another one that will be in contrast to the major one. There are so many beautiful and different style tiles available in the market which is the perfect match for your bathroom interior. Bathroom can be one place of your house where you can show off your personality and status. You can also take risk with the colour or pattern of the tiles. This will definitely create a wow factor in the mind of all guests, whosoever uses your bathroom. Moreover, the colour you select for your bathroom should be natural. Also, focus on the back wall of the shower as well. Moving ahead with the fun tiles on the floor of the bathroom and keep it to be in natural colored one would be the best idea to do so. Most of the people are lazy in cleaning up the tiles or tub or shower of the bathroom. So, if you want to keep yourself free from this daily task then go for ceramic tiles, as they do not need that much maintenance. Specially, tiles made up of the natural stones need maintenance. As they have pours in the texture so they tend to have collection of dirt into it. If you want to add texture with natural stones, it is good idea to use it on the floor or that corner of the bathroom which is less wet portion. Moreover, glass tiles are so slippery and it won’t work out to be the perfect one on the floor. 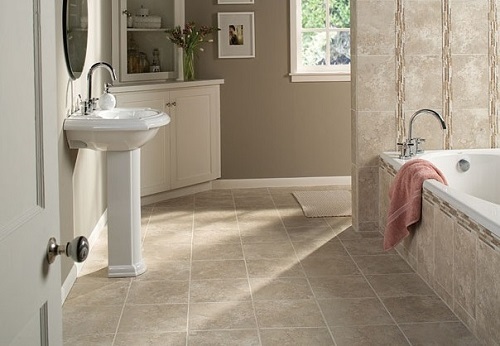 When it comes to bathroom, large tiles are particularly useful and very “IN” in the market. 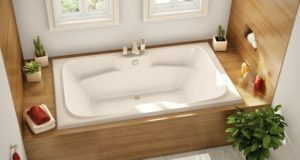 You can also get the smaller cut of the same design you chosen and you can put them at corner lining of the bathroom. For instance, if you are selecting the measurement of bigger size as 12*24 inch then the smaller one might be 2*2 inch. Also, you put the smaller tiles on the corner of the bigger tile to give a new look to your bathroom. But make sure to select the tile that is made of slip free material.